Stating clearly "ou vai para fora ou vai para a cadeia" (meaning either ‘they go overseas, or they go to jail’), right-wing conservative frontrunner for the second round of the Brazilian presidential elections Mr Jair Bolsonaro addressed his supporters on Sunday and vowed to purge the political rival class. After three consecutive left-wing presidents either jailed (Lula), fired (Rousseff) or under investigation for corruption (Temer), the Brazilian populace seem to have had enough. Although Mr Bolsonaro has foregone even debating his left-wing rival of the ruling Workers Party (PT), Mr Fernando Haddad, every opinion poll has him winning by landslide victory this Sunday. And so, the favourite to become Brazil’s next president vowed to spearhead a historic purge of his left-wing political foes in an address which delighted his many supporters while leaving his political opponents outraged and unnerved. The world’s fourth-largest democracy will return to the polls this Sunday 28 October for the decisive second round of its presidential election. Even the most negative poll says Mr Bolsonaro will win with an 18-point lead. 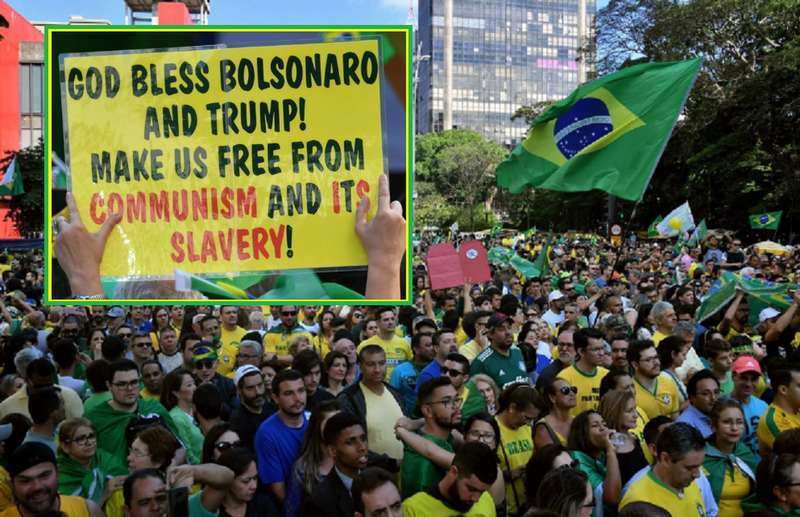 Mr Bolsonaro was back to his old ways addressing his supporters, and repeating what his vice-presidential candidate, a former army general, has also vowed. If elected, the political class will be purged and all those under investigation for corruption will face several jail sentences. The evangelical candidate and former army captain pledged to use the presidency to launch a frontal assault on his “red” political rivals. “We are the majority. We are the true Brazil. Together with this Brazilian people we will build a new nation,” Mr Bolsonaro stated. His Left-Wing rival Mr Haddad has meanwhile tried in a desperate attempt to make up his poll loss to heighten Brazil’s social benefits payments, a move that most economists agree would plunge the country in recession or would see the currency devaluated. Needs to be down here or we will never be the Good `ole US of A again.